The Marquee tool is ideal for frames and vignettes, where the selections are based on rectangles and ellipses, but it is completely unsuitable for making selections of irregular objects within an image. Fortunately, there is an alternative – the Lasso tool. With the Lasso, you can describe the boundaries of an object and have everything within that boundary selected. In fact, the Lasso tool is a family of tools. 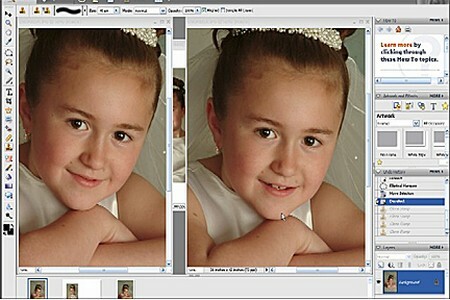 Though the family varies in size according to the image editing application in use, there are three basic variations. Use the Freehand Lasso to select an object by drawing – freehand – around its boundaries. Use the Magnetic Lasso to draw a selection automatically. This intelligent tool identifies the edge of the selection and attaches itself neatly. It isn’t foolproof – it can go astray where contrast is low or there are alternate edges – but it is great for making complex selections. The Polygonal Lasso can be used to describe multi-sided selections using straight line segments. It is especially useful for selecting buildings and architectural details. Using each of the Lasso types is easy. With the mouse button pressed, drag the cursor around the area you wish to select. Release the mouse button when you are at, or very close to the start point. The freehand Lasso is best reserved for making rough selections when testing out an effect, for example, or for situations where pinpoint accuracy is not required. An example of the latter might be a feathered selection or vignette where an informal, freehand shape was required rather than something more geometric. You could achieve a more precise effect by working more slowly, or by enlarging the image further. But why create additional work for yourself when you can use the Magnetic Lasso?
. Click the mouse to determine the first, fixed point (usually a corner). Move the mouse to the next corner and click again. A straight line will be drawn between the two points. Continue with additional edges, finally clicking again at the start point. Architectural subjects such as the church are ideal for the Polygonal Lasso. Small details can be included by drawing short sides. There is no practical limit to the number of sides that your polygon can have; when you are tracing a complex shape (such as some of the architectural detail in this example) you can click repeatedly at every corner. Do take care, however, not to be too fast. If you click on two points in very quick succession, the computer will interpret that as the instruction to ‘close’ the selection. The result will be a selection based on the points drawn so far, joined back to the start point – not what you had intended. The Add To Selection feature enables an imprecise selection to be refined by adding to it any parts that were not selected. Normally, any selection tool can be used to add elements to a selection, not just the tool used to make the original selection. The Polygonal Lasso can also be used to select curved shapes. Simply click at short intervals around the perimeter.